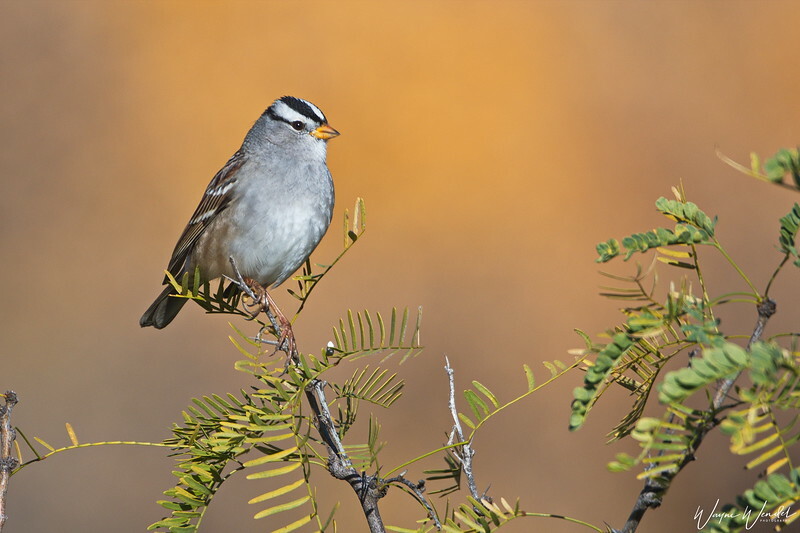 This White-crowned Sparrow sat patiently watching me as I was stalking and photographing a wandering coyote. Then I remembered what Ansel Adams said to me,"A bird in the hand is worth two in the bush." Well, maybe he didn't say that but it's hard to pass up such a cooperative, normally shy guy. Photo taken in Bosque del Apache NWR about three weeks ago with a Nikon D500 & Nikkor 80-400mm lens at 400mm=600mm, ISO:280, f/5.6 at 1/1500 sec. May the Lord give you good light, good health and interesting subjects. Superb shot! Looks like it’s on a canvas with that magnificent bg! A bird in the hand is better than a coyote in the bush?? ;-) Great shot of the WC Sparrow, catch light in its eye. Lovely detail , great catch light and super composition. This is so pretty Wayne! Really well done. Super sharp capture, great comp...looks like it should be in a bird book!